India’s Mirabai Chanu Wins Gold Medal At World Weightlifting Championship: -Saikhom Mirabai Chanu became the first Indian after 2 decades to win a gold medal at the World Weightlifting Championship. Mirabai Chanu come in news post she lifted a total of 194 kg in the 48kg category at Anaheim, USA, and she did this on the last Wednesday. Chanu, participating in the women’s 48kg event at the Championships which was held in Anaheim, USA, and this was started with a total of 85kg and then followed up with 109kg to deliver India. It is the second gold medal won by Mirabai Chanu from India after; Karnam Malleshwari had bagged the gold in 1994 and 1995. “Mirabai Chanu gives total credit to her coach Vijay Sharma for this medal. She said that she really worked hard for this and she received full support from her coaches. Mirabai Chanu was in full praised for her coached and she is also hopeful to replicate this in Tokyo in 2020,” Mirabai told to various media house after winning the medal. 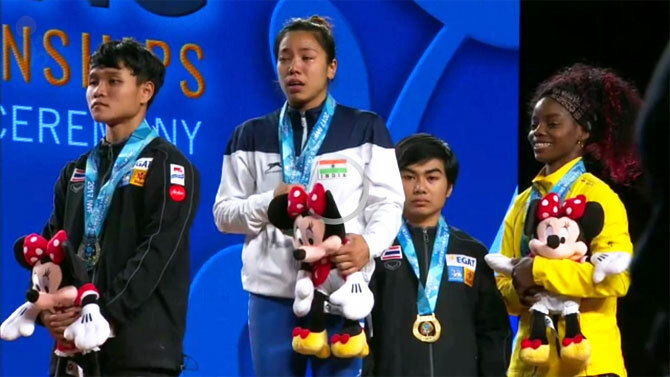 In Anaheim, Chanu was always considered a medal contender but seems like for the India it maybe Chanu has to settle for silver with Thailand’s Thunya Sukcharoen. She needed just match her 109 kg effort and attempt in the jerk and the clean to clinch the top spot. But Sukcharoen failed and took the silver which is the total of the 193 kg while Colombia’s Ana Iris Segura won the bronze with a total lift of 182 kg. Some of the world’s top weightlifting nations such as Russia, China, Kazakhstan, Ukraine, and Azerbaijan neither was nor part of this competition in 2017 because there were some issues related to doping. Chanu’s outing in Anaheim is somehow distinct from the way things happened in Rio from the last year when at last year her performance was a disappointing performance. But this year her fate supports her and she finally lifted a total of 194 kg in the 48kg and this is now making the news. In a field of 12 lifters at the Rio Games, she was one of two lifters who did not finish (DNF) her event on last year. Seeing the tricolor from the podium, tears of joy and some everlasting satisfaction and happiness shown on her face, this is a rare and special honor Chanu picked at the marquee event being an Indian and this is pride for the whole country literally. This is an indeed a new record set by Saikhom Mirabai Chanu not only for being a woman, rather being an Indian on the global level.